I was very skeptical when I booked this place for a weekend getaway - normally you can make ordinary things look good with great photography, but Villa Christophe was an example of how immature the camera actually is!!! The villa was beautifully and tastefully decorated, the rooms were brilliant and our room was a masterpiece. 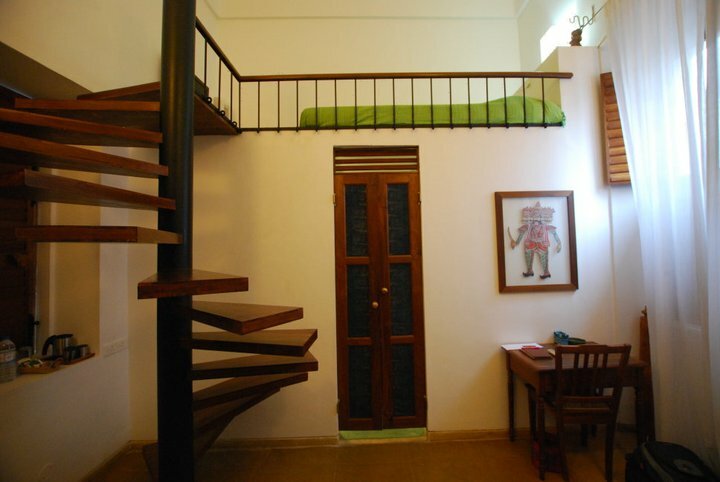 There was a washroom on the lower level, while the bed was the level above. Nothing on the first level except the bed and a TV. There are just three rooms in this house and you can book the whole house if you want, provided it is free. The others rooms were equally tastefully decorated, but the bed on top was an attraction for me. There is one cook and one helper in the villa and there is no real check in of sorts. The cook made us a simple but brilliant breakfast, laid it out on the table and woke us up! If you buy some fish or prawns they will cook it up for you, but we ate out for lunch and dinner! With lots of wonderful places around the corner, there is not dearth of good food close by! The villa is only about 400m from the beach, and close to all the major restaurants and parks! Priced at Rs 3000 per night, it is a 4 star villa at 3 star prices!!! I did not find it on any hotel booking website and so booking with the villa is the best way to book I guess. Here is the link. If you are wondering what is happening with Chennai Foodie, don't! My experiences about eating out are not going anywhere, but if you remember the blog is titled - Eating Out, Cooking, Traveling, Fun. Since I do a lot of research before I travel, I was asked by followers (if you are among them, then this last paragraph does not apply to you) to write about them. I started writing about eating out of Chennai and the stays will now follow!!! And hey, if you enjoyed reading this, please share it!